Why theater? : I actually thought about a lot of different ways in which I could present the source material for Steve: A Docu-Musical...at one point even dreaming up an interactive installation piece... in the end I thought a live show with storytelling, songs and projections would be the best way to tell our story. Tell us about Steve: A Docu-Musical? : The show is the true story of my relationship with the title character. 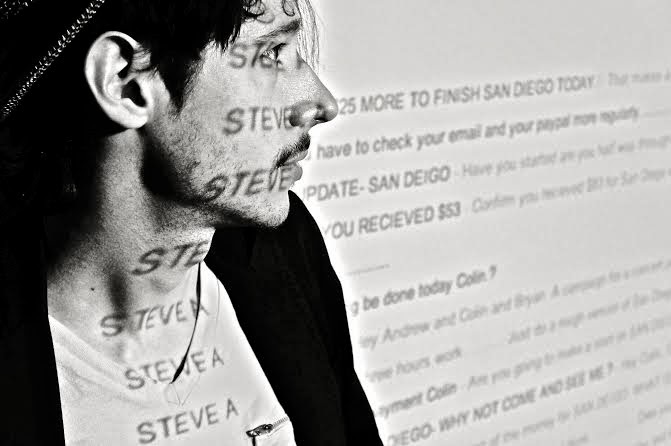 Steve has written over a hundred songs through a website that I started with my roommate called www.PoetryToMusic.com. He writes the lyrics and we write the music. Using selections and anecdotes from our five years communicating via email, I try to tell a really unique story about what it means to be an artist, and what it means to be in constant contact with somebody whom you have never met in person. What inspired you to create Steve: A Docu-Musical? : Basically, I kept telling my friends stories about Steve. They knew that he had become a part of my life, and there was usually something interesting going on with him. He's a really captivating personality and it seemed like really ripe material for a solo show. What kind of theater speaks to you? What or who inspires you as an artist? : I like variety. Any kind of theater that makes me laugh and cry. I like a lot of abstract stuff, but I also like straight forward storytelling. If you could work with anyone you’ve yet to work with, who would it be? : What a crazy hard question! What show have you recommended to your friends? : "Too Much Light Makes The Baby Go Blind" by the New York Neo-Futurists. Who would play you in a movie about yourself and what would it be called? : I'm into non-traditional casting so I think it'd be great to see myself played by a woman. Maybe Helena Bonham Carter, she usually nails it. Title: "Over-thinkers Anonymous". What’s your biggest guilty pleasure? : Sleeping past noon. What’s the most played song on your iPod? : I don't actually have an ipod, but according to the stats on my laptop, my most played song in itunes is "Worm Mountain" by The Flaming Lips. If you weren’t working in theater, you would be _____? : Well most of my time is spent crossing the line between music and theater. So I suppose I'd be working in music. If you take music out of the equation then maybe I could be a woodworker or something. I like making things. What’s up next? : Hopefully more to come with Steve: A Docu-Musical, but I'm also composing music for a dance piece, in addition to writing and recording with my band Toys And Tiny Instruments.